On Wednesday, January 15, 2003, I filmed a television show with Bill Nye in Seattle, Washington, for a new PBS science series entitled Eye on Nye. This series is an adult-oriented version of Bill’s wildly successful 100-episode children’s series Bill Nye the Science Guy. This 30-minute segment was on psychics and talking to the dead. Although I have analyzed the process and written about it extensively in Skeptic, Scientific American, How We Believe, and on www.skeptic.com, I have had very little experience in actually doing psychic readings. Bill and I thought it would be a good test of the effectiveness of the technique and the receptivity of people to it to see how well I could do it armed with just a little knowledge. Although the day of the taping was set weeks in advance, I did absolutely nothing to prepare until the day before. This made me especially nervous because psychic readings are a form of acting, and good acting takes talent and practice. And I made matters even harder on myself by convincing Bill and the producers that if we were going to do this we should use a number of different psychic modalities, including Tarot cards, palm reading, astrology, and psychic mediumship, under the theory that these are all “props” used to stage a psychodrama called cold reading (reading someone “cold” without any prior knowledge). I am convinced more than ever that cheating (getting information ahead of time on subjects) is not a necessary part of a successful reading. I read five different people, all women that the production staff had selected and about whom I was told absolutely nothing other than the date and time of their births (in order to prepare an astrological chart). I had no contact with any of the subjects until they sat down in front of me for the taping, and there was no conversation between us until the cameras were rolling. The setting was a sound stage at KCTS, the PBS affiliate station in Seattle. Since sound stages can have a rather cold feel to them, and because the set-up for a successful psychic reading is vital to generate receptivity in subjects, I instructed the production staff to set up two comfortable chairs with a small table between them, with a lace cloth covering the table and candles on and around the table, all sitting on a beautiful Persian rug. Soft colored lighting and incense provided a “spiritual” backdrop. Rowland stresses the importance of the pre-reading set-up to prime the subject into being sympathetic to the cold reading. He suggests — and I took him up on these suggestions — adopting a soft voice, a calm demeanor, and sympathetic and non-confrontational body language: a pleasant smile, constant eye contact, head tilted to one side while listening, and facing the subject with legs together (not crossed) and arms unfolded. I opened each reading by introducing myself as Michael from Hollywood, calling myself a “Psychic Intuitor.” I explained that my “clients” come to see me about various things that might be weighing heavy on their hearts (the heart being the preferred organ of New Age spirituality), and that as an intuitor it was my job to use my special gift of intuition. I added that everyone has this gift, but that I have improved mine through practice. I said that we would start general and then get more focused, beginning with the present then glancing back to the past, and finally taking a glimpse of the future. I also noted that we psychics cannot predict the future perfectly — setting up the pre-emptive excuse for later misses — by explaining how we look for general trends and “inclinations” (an astrological buzz word). I built on the disclaimer by adding a touch of self-effacing humor meant also to initiate a bond between us: “While it would be wonderful if I was a hundred percent accurate, you know, no one is perfect. After all, if I could psychically divine the numbers to next week’s winning lottery I would keep them for myself!” Finally, I explained that there are many forms of psychic readings, including Tarot Cards, Palm Reading, Astrology, and the like, and that my specialty was…whatever modality I was about to do with that particular subject. Since I do not do psychic readings for a living, I do not have a deep backlog of dialogue, questions, and commentary from which to draw, so I outlined the reading into the following themata that are easy to remember (that is, these are the main subject areas that people want to talk about when they go to a psychic): Love, Health, Money, Career, Travel, Education, Ambitions. I also added a personality component, since most people want to hear something about their inner selves. I didn’t have time to memorize all the trite and trivial personality traits that psychics serve their marks, so I used the Five Factor Model of personality, also known as the “Big Five,” that has an easy acronym of OCEAN: openness to experience, conscientiousness, extroversion, agreeableness, and neuroticism. Since I have been conducting personality research with my colleague Frank Sulloway (primarily through a method we pioneered of assessing the personality traits of historical personages such as Charles Darwin, Alfred Russel Wallace, and Carl Sagan through the use of expert raters), it was easy for me to riffle through the various adjectives used by psychologists to describe these five personality traits. For example: openness to experience (fantasy, feelings, likes to travel), conscientiousness (competence, order, dutifulness), agreeableness (tender-minded versus tough-minded), extroversion (gregariousness, assertiveness, excitement seeking), and neuroticism (anxiety, anger, depression). Since there is sound experimental research validating these traits, and I have learned through Sulloway’s research how they are influenced by family dynamics and birth order, I was able to employ this knowledge to my advantage in the readings, including (with great effect) nailing the correct birth order (first-born, middle-born, or later-born) of each of my subjects! You can be a very considerate person, very quick to provide for others, but there are times, if you are honest, when you recognize a selfish streak in yourself. I would say that on the whole you can be rather quiet, self-effacing type, but when the circumstances are right, you can be quite the life of the party if the mood strikes you. Sometimes you are too honest about your feelings and you reveal too much of yourself. You are good at thinking things through and you like to see proof before you change your mind about anything. When you find yourself in a new situation you are very cautious until you find out what’s going on, and then you begin to act with confidence. What I get here is that you are someone who can generally be trusted. Not a saint, not perfect, but let’s just say that when it really matters this is someone who does understand the importance of being trustworthy. You know how to be a good friend. According to Rowland — and he was spot on with this one — the statement “You are wise in the ways of the world, a wisdom gained through hard experience rather than book learning” was flattery gold. Every one of my subjects nodded furiously in agreement, emphasizing that this statement summed them up to a tee. I added one of my own to great effect: “I see a white car.” All of my subjects were able to find a meaningful connection to a white car. As I was reading this list on the flight to Seattle the morning of the reading, I was amazed to discover how many flight attendants and people around me validated them. The wheel is set against a field of stars symbolizing the cosmos. Below, looking upward, is the Mother, the Earth. At the upper left is the Sky Father, Zeus. At the upper right is an androgynous child. The child, with its wizened face, represents humanity and our ancestors. Inside the Wheel, the mushrooms symbolize luck, the snake, rebirth, the eye, time, the dinosaur, all things lost in the turning of time. Divinatory meanings: Change of circumstances. Taking hold of one’s life. Grabbing hold of fate. Time to take what life has given you. For dramatic effect I added the death card to my presentation (Figure 1.1). The image of the boat belongs to birth as well as to death; the baby’s cradle originally symbolized a boat. The trees and grass signify plants, the bones, minerals, the birds, the animal world, and the ferryman, the human world. The peacock’s eye in the center signifies looking at the truth in regard to death. The bird also symbolizes the soul and the divine potential of a person. 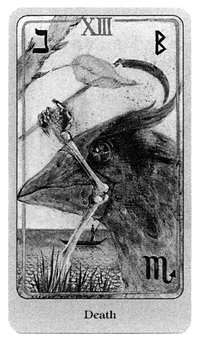 Divinatory meanings: The Death card rarely refers to physical death. Rather, it has to do with one’s feelings about death. Psychologically, letting go. New opportunities. Since this subject was my first reading I was a little stiff and nervous, so I did not stray far from the standard Barnum reading, worked my way through the Big Five personality traits fairly successfully (and from which I correctly guessed that she was a middle child between first and last born siblings), and did not hazard any of the high probability guesses. Since she was a student I figured she was indecisive about her life, so I offered lots of trite generalities that would have applied to almost anyone: “you are uncertain about your future but exited about the possibilities,” “you are confident in your talents yet you still harbor some insecurities,” “I see travel in you immediate future,” “you strike a healthy balance between head and heart,” and so forth. 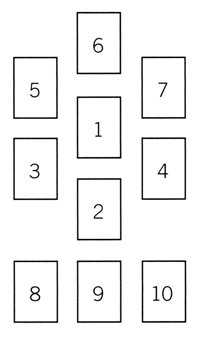 Tarot cards are a great gimmick because they provide the cold reader with a prop to lean on, something to reference and point to, something for the subject to ask about. I purposely put the “Death” card in the spread because that one seems to make people anxious (recall the “Death” card was in the news of late because the east coast sniper of 2002 said that it influenced him to begin his killing spree). This gave me an opportunity to pontificate about the meaning of life and death, that the card actually represents not physical death but metaphorical death, transitions in life are a time of opportunity — the “death” of a career and the “rebirth” of another career — and other such dribble. The bait was set and the line cast. I had only to wait for the fish to bite. After each reading the producers conducted a short taped interview with the subject, asking them how they thought the reading went. This young lady said she thought the reading went well, that I accurately summarized her life and personality, but that there were no surprises, nothing that struck her as startling. She had experienced psychic readings before and that mine was fairly typical. I felt that the reading was mediocre at best. I was just getting started. My second reading was on a young woman aged 19. Palm reading is the best of the psychic props because, as in the Tarot cards, there is something specific to reference, but it has the added advantage of making physical contact with the subject. I could not remember what all the lines on a palm are suppose to represent, so while I was memorizing the Tarot cards, my daughter did a google image search for me and downloaded a palm chart (Figure 1.3). If the Head and Lifelines are connected it means that there was an early dependence on family. The strength of the Head line indicates the thinking style — intuitive or rational. Breaks in the Head line may mean there was a head injury, or that the subject gets headaches, or something happened to the head at some time in the subject’s life. On one web page I downloaded some material about the angles of the thumbs to the hand that was quite useful. You have the subject rest both hands palm down on the table, and then observe whether they are relaxed or tight and whether the fingers are close together or spread apart. This purportedly indicates how uptight or relaxed someone is, how extroverted or introverted they are, how confident or insecure they feel, etc. 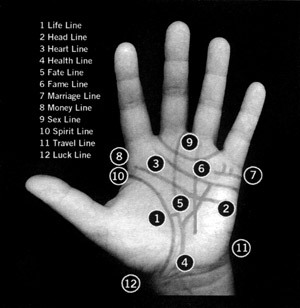 According to one palm reader a small thumb angle “reveals that you are a person who does not rush into doing things. You are cautious and wisely observe the situation before taking action. You are not pushy about getting your way.” A medium thumb angle “reveals that you do things both for yourself and for others willingly. You are not overly mental about what you are going to do, so you don’t waste a lot of time doing unnecessary planning for each job.” And a big thumb angle “reveals that you are eager to jump in and get things done right away. You do things quickly, confidently, and pleasurably because you like to take charge and get the job done.” Conveniently, you can successfully use any of these descriptions with anyone. It turns out that you can tell the handedness of a person because the dominant hand is a little larger and more muscular. That gave me an opening to tell my mark, who was left-handed, that she was right-brain dominant, which means that she puts more emphasis on intuition than on intellect, that she is herself very intuitive (Rowland says that a great ruse is to flatter the subjects with praise about their own psychic powers), and that her wisdom comes more from real world experience than traditional book learning. She nodded furiously in agreement. According to the various palm reading “experts,” you are suppose to comment on the color and texture of the skin, hair on the back of the palm, and general shape of the hands. Any major discrepancy between the two hands is supposed to be a sign of areas where subjects have departed from their inherited potential. The psychic should also take note of the shape of the fingers. The outer phalanges of the fingers (the finger tips) represent spiritual or idealistic aspects of the person, the middle phalanges everyday and practical aspects, and the lower phalanges the emotional aspects of personality. I found it most effective to rub my fingers over the mounds of flesh on each finger segment while commenting on her personality. For this reading I threw in a few high probability guesses, starting with the white car. It turns out that this subject’s 99-year old grandmother had a white car, which gave me an opening to comment about the special nature of her relationship with her grandmother, which was spot on. Then I tried the out-of-date calendar, which did not draw an affirmative response from my subject, so I recovered by backing off toward a more general comment: “Well…what I’m getting here is something about a transition from one period in your life to another,” which elicited a positive affirmation that she was thinking of switching majors. This subject’s assessment of my reading was slightly more positive than the first subject’s, as was my own self-evaluation, but no one was yet floored by anything said. I was still gathering steam for the big push to come. My third subject was another young lady, age 20, and was my toughest read of the day. She gave monosyllabic answers to my incidental questions for extracting information, and did not seem to have much going on in her life that required much in the way of psychic advice. 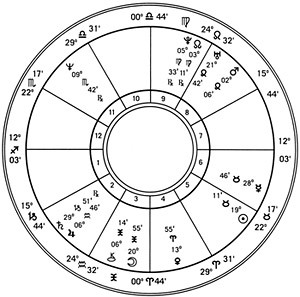 I downloaded an astrological chart from the Internet (Figure 1.4). It was constructed some time ago for a guy named John, born May 9, 1961. My subject was born September 3, 1982. I haven’t got a clue what the chart is suppose to mean, but since it doesn’t actually mean anything I began by explaining that “the stars incline but do not compel,” and then I just made up a bunch of stuff about how the conjunction of having a rising moon in the third house and a setting sun in the fifth house is an indication that she has a bright future ahead of her, and that her personality is a healthy balance between mind and spirit, intellect and intuition. Her nods indicated agreement. I tossed out a bunch of high probability guesses and got about half of them right (including the line about wearing her hair longer at a younger age), then closed the reading by asking her if she had any questions for me. She said that she had applied for a scholarship in order to participate in a foreign student exchange program in England, and wanted to know if she was going to get it. I responded that the important issue at hand was not whether she was going to get the scholarship or not, but how she would deal with getting it or not getting it, and that I was highly confident that her well balanced personality would allow her to handle whatever the outcome. This seemed to go over well. In the post-reading interview she was much more positive than I anticipated, considering how stilted the reading was, so I suppose we can count this one as a success as well, although I was not particularly proud of it. My fourth subject was a 58-year old woman, for which I was to do a straight cold read with no props. I began with the Barnum reading, but did not get far into it before it became apparent that she was more than a little willing to talk about her problems. She did not want to hear all that generic crap. She wanted to get straight to the specific issues on her mind that day. She was overweight and did not look particularly healthy, but since I didn’t want to say anything about her weight I said I was picking up something about her being concerned about her health and diet, guessing, since this was still early January, that she probably made a New Year’s resolution about losing weight and starting a new exercise program. Bingo! This subject then opened up about her recent back surgery and other bodily ailments. I tried a number of high probability guesses that worked quite well, especially the box of photographs, broken gadgets around the house, and the short hair/long hair line, all hits, especially the hair, which she explained she changes constantly. I said I was getting something about a scar or scrape on her knees, and that left her slack jawed. She said that she had not scraped her knees since childhood, but had just the week before fallen down and tore them up pretty badly. Swish! Although I was able to glean from the conversation that she had recently lost her mother, and a few minutes of generic comments from me about her mother staying close to her in her memory left her in tears, she really came to find out about her son. What was he going to do? A minute of Q&A revealed that he is a senior in high school, so I assumed that as his mother she was worried about him going off to college. Nothing but net! What in particular was she worried about? He was thinking of going to USC, so I jumped in before she could explain, and surmised that it was because the University of Southern California is located in downtown Los Angeles, not exactly the safest neighborhood in the area. My last subject was a woman age 50, who turned out to be my best reading. She had told Bill’s producer that she had something very specific she wanted to talk about, but did not offer a clue as to what it was. It didn’t take me long to find out. When I introduced myself and shook her hand, I noticed that her hands were exceptionally muscular and her palms sweaty. This was a high-strung, nervous person who was obviously emotional and agitated. I assumed that someone near to her had died (the proper phrase is “passed into spirit”), and that she wanted to make contact. “I’m sensing several people that have passed over, either parents or a parent-like figure to you.” It was her father who died, and she clearly had unfinished business with him. From the ensuing conversation I discovered that her father had died when she was 27, so I deduced that it must have been a sudden death and that she did not have the opportunity to make her peace with him (both correct). Finally, I accurately deduced that she was sad because she would have liked to share her many life experiences over the past two decades with her father…“such as having a child.” Wrong — she is childless. Without missing a beat I offered this riposte: “Oh, what I mean is…giving birth to a new idea or new business.” A three-pointer from downtown! This was an entrepreneurial woman whose father was a successful businessman with whom she would have loved to share the success. It wasn’t long before my charge was nearly sobbing. This was an emotionally fragile woman of whom I could have easily taken advantage by jumping in with some inane line such as “your father is here with us now and he wants you to know that he loves you.” But I knew I would have to look at myself in the mirror the next morning and just couldn’t do it, even for a worthwhile exposé of a very evil practice. Instead I said “your father would want you to keep him in your heart and your memories, but that it is time now to move on.” I wanted to give her something specific, as well as lighten up the reading because it was getting pretty glum, so I said “and it’s okay to throw away all those boxes of his stuff that you have been keeping but want to get rid of.” She burst out laughing and confessed that she had a garage full of her father’s belongings that she had long wanted to dispose of but was feeling guilty about doing so. This exchange was, I hoped, a moral message that violated no trust on my part and still had the desired effect for our show. I am not a psychic and I do not believe that ESP, telepathy, clairvoyance, clairaudience, or any of the other forms of psi power have any basis whatsoever in fact. There is not a shred of evidence that any of this is real, and the fact that I could do it reasonably well with only one day of preparation shows just how vulnerable people are to these very effective nostrums. I can only imagine what I could do with more experience. Give me six hours a day of practice for a couple of months and I have no doubt that I could easily host a successful syndicated television series and increase by orders of magnitude my current bank balance — there for the grace of evolved moral sentiments and guilt-laden scruples go I. I cannot do this for one simple reason — it is wrong. I have lost both of my parents — my father suddenly of a heart attack in 1986, my mother slowly from brain cancer in 2000 — and I cannot imagine anything more insulting to the dead, and more insidious to the living, than constructing a fantasy that they are hovering nearby in the psychic aether, awaiting some self-proclaimed psychic conduit to reveal to me breathtaking insights about scarred knees, broken appliances, and unfulfilled desires. This is worse than wrong. It is wanton depravity.